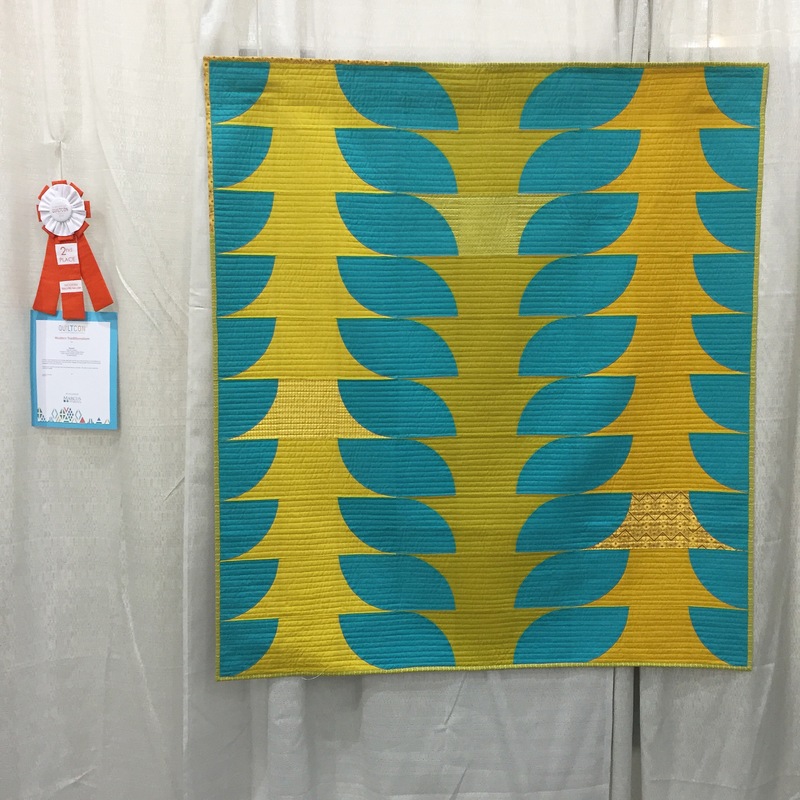 I went to Quiltcon this past weekend, and while I spent a lot of last year’s show completely overwhelmed, I managed to have a really great time. I have some commentary and I’d love to write about what I’ve learned from the experience in a future post, but for today, it’s just the facts. I went to Quiltcon in Pasadena. I had three quilts in the show. One of them, Flounce, won second place in the Modern Traditionalism category. I still kind of don’t believe it. Another of them, Momentum, is a pattern that is in the Quiltcon issue of Modern Patchwork (on newsstands March 1). It hung in the Minimalism category. The third is First Position, which hung with the Small Quilts category. I met some truly amazingly talented people. This is a very few number of them. They were all such kind and generous people. I went to two lectures and a panel. Gwen Marsden’s keynote speech, Rebecca Bryan’s lecture Tension Between Classical and Improvisational Piecing, and Anne Sullivan’s panel about staying creative, which featured Jennifer Sampou, Eliane Thibault, and Anna Maria Horner. I saw all of the nearly 400 quilts in the show, as planned. They were beautiful. Many of them were also very meaningful. I forgot my nice camera and therefore didn’t take good pictures of many of them. I regret this. But besides forgetting my camera and making a few cringe-worthy jokes, there are very few things I regret about this trip. I could have met more people (and there are a few more I wish I had met, though I don’t know when that would have happened), but I left exhausted and full of great quilty ideas. I spent the flight home sketching and writing and thinking about what comes next. Fantastic Melanie! Looks like a great time. Glad I could supplement photos for you. It sounds like you couldn’t have scripted a more successful trip, really.